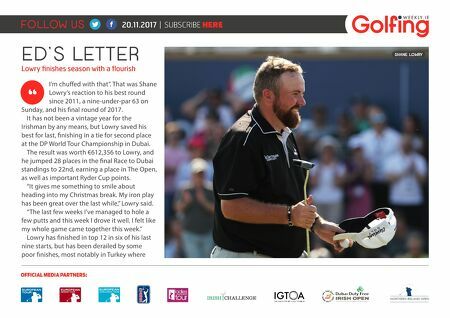 FOLLOW US 20.11.2017 | SUBSCRIBE HERE OFFICIAL MEDIA PARTNERS: NORTHERN IREL AND OPEN SHANE LOWRY ED'S LETTER Lowry finishes season with a flourish I'm chuffed with that". That was Shane Lowry's reaction to his best round since 2011, a nine-under-par 63 on Sunday, and his final round of 2017. It has not been a vintage year for the Irishman by any means, but Lowry saved his best for last, finishing in a tie for second place at the DP World Tour Championship in Dubai. The result was worth €612,356 to Lowry, and he jumped 28 places in the final Race to Dubai standings to 22nd, earning a place in The Open, as well as important Ryder Cup points. "It gives me something to smile about heading into my Christmas break. My iron play has been great over the last while," Lowry said. "The last few weeks I've managed to hole a few putts and this week I drove it well. I felt like my whole game came together this week." Lowry has finished in top 12 in six of his last nine starts, but has been derailed by some poor finishes, most notably in Turkey where "